How doomed are we, really? Even the most pessimistic independent forecasters don't see the economy in 2009 contracting by more than say 0.25 per cent. The worst years for growth since 1948 (when the economy shrank), were: 1991 (-1.5 per cent); 1980 and 1981 (-2.2 per cent and -1.3 per cent); and 1974 and 1975 (-1.7 per cent and -0.6 per cent). Few expect things to be quite as bad now: does Mr Darling? Current inflation, at 5 per cent or so, is not a patch on August 1975's record of 26.9 per cent. In terms of the financial system, the last time the banks were unable to provide credit to the wider economy on any scale was during the secondary banking crisis of 1973-74, a short-lived and minor affair, compared with our $1 trillion global meltdown. Then again, Mr Darling could be thinking of the Depression of 1930 to 1932, the last global credit crunch. Then the UK's economy declined by 15 per cent, many banks collapsed and the world was left with Hitler and the road to Armageddon. We really have to make our minds up; are we ready to try and persuade this country to support us for another term? I can think of better ways of going about it, myself. On a visit to East Germany in 1985, I met an MP who belonged to the GDR's Christian Democratic party. I was part of a group who were also meeting Quakers who found it difficult to practice their beliefs. Now, you might have assumed that Eastern European countries were all one-party states. But in East Germany, they had preserved the illusion of democracy by allowing the German CDU and liberals to continue, so long as they voted with the communists on all matters. And by the eighties, they just about tolerated religion, so long as it was private; and religious people could not expect senior posts in the country. I was reminded of this as I listened to the bizarre proposals being put forward by the secularist lobby group, Accord, which wants faith schools to stop admitting any of their co-religionists by right and to stop employing co-religionists on the staff . In short, it wants to do everything possible to emasculate faith schools except in their name and those who run them. In fact, faith schools are far better at helping poorer pupils to achieve their potential than other schools, even if they have marginally fewer pupils on free school meals. Irish Catholics were able to make their mark in Britain thanks to Catholic schools; other religions deserve the same chance. But the secularist lobby - which often coincides with those opposed to Academies on the bizarre grounds that they turn sink schools into genuine comprehensives by daring to attract a proportion of middle class parents - will have none of this. Sameness is all that matters; the ethos means nothing. Nor does the fact that new faith schools now must leave 25% of places - a fair proportion - for those outside their faith. Often faith schools exceed that goal, but it is absurd to suggest that where there are limited school places for a particular faith, there should be no faith criteria. By all means, let's ensure a fair intake among applicants of faith, who belong to all social classes. But let's not abolish some of our best schools by ideological stealth. 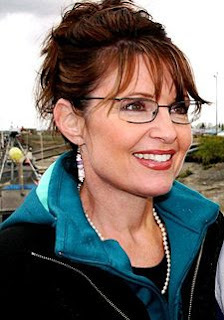 So, John McCain's running mate will be Alaska Governor Sarah Palin. Despite her right-wing politics, the 44-year old mother may prove attractive to those waverers who were disappointed by Hillary's loss, and remain unconvinced by Obama. It shows just what a tight race this is likely to be. McCain has played a blinder on this with all that talk about Mitt Romney, and he will doubtless play some more before this contest is decided. One can only hope that Obama has some people of similar tactical skill on his team. Having done the business in Denver, Obama needs to ensure he gives as good as he gets. Barack Obama's speech last night was every bit as impressive a performance as one would expect from someone of his oratorical skills. He rightly eschewed too much grand rhetoric for more down to earth detail, and was not afraid to start attacking John McCain, in that "respectful" way that Democrats do these days. One can hope that he will be more like John Kerry 2008 than John Kerry 2004 in that respect, not least when McCain has hired the entire Republican dirty tricks crew to do his 'straight talking' for him. From Obama's point of view, this has been a good convention. There have been great performances by his wife, Michelle and the Clintons. Ted Kennedy's emotional appearance and Joe Biden's contribution will have helped galvanise Democrats, and may improve Obama's credibility with blue collar voters. But it is still not yet clear what Obama's strategy is to win over centre ground voters and moderate Republicans. In part, he needs to remind people of Bush's failures, and do so unapologetically. In part, he must hope that McCain's tetchiness gets the better of him, as it seems to have done with Time this week. But in big part, this is also going to depend on persuading enough people that he is the right man for these times. He has made some silly gaffes, the biggest of which was the Berlin rally; despite his difficult upbringing, he has allowed himself to appear more elitist than seven-home owning John McCain. But his basic platform is stronger and (education excepted, where he is too beholden to vested interests despite some frankness on sacking poor teachers) a lot more consistent than his liberal critics contend. He needs now to find a few clear policy areas - Iraq aside -on which to define himself in ways that transcend the historical nature of his candidacy. The polls may be close now, and are likely to be no less so after the Republican convention. If Obama gets it right, he can transcend the attacks and win in November. But his team need to be attuned to winning a national election not just carving up liberal caucus votes. He needs to be clear what his key pledges are and repeat them until people know what they are and how they will be delivered. He made a good start last night. But it is just a start. It is flattering that this blog has been voted No 5 in Iain Dale's list of top Northern Irish blogs. And who could fail to be pleased about appearing reasonably prominently in a list led by the great Slugger O'Toole? There is a slight problem, however. This is not really a Northern Irish blog. It is written by a Dubliner based in Bath, and while it is true I do occasionally comment on Northern Irish affairs; I write more about those of the Republic these days, and my main focus is UK politics, education, culture and travel. Of course, I'm grateful for the listing; and, thanks for those votes. But the blog won't be moving from Bath to Belfast anytime soon. Barack Obama's decision to pick Joseph Biden, the Delaware senator and Neil Kinnock fan, as his running mate has been criticised in some quarters for being boring. And there is a part of this blog which would have liked to see Hillary chosen; at the very least, the Obama team could have shown her a bit more respect. But Obama probably needs boring white male with foreign experience as his running mate to reassure those voters worried about the novelty of his own candidacy. The only question is: why didn't he pick a governor or a senator from a state with votes that mattered? Delaware hardly fits the bill, even if it watches TV from Pennsylvania. This is a neutral appointment; Obama needs to do rather more to regain the initiative in Denver this week if he is to establish a strong lead over McCain ahead of the Republican convention. We have just returned from a great weekend in Bordeaux, a city magnificently restored under the leadership of Alain Juppe, the city's somewhat controversial mayor. There is much to see in the many pedestrianised streets and squares, with the gleaming new trams and bicycles the only transport allowed in many. The 18th century architecture has been spruced up to show it at its best. Shopping and restaurant-filled streets are mercifully traffic-free, and support a lively cafe culture. We enjoyed a good €460 three night B&B deal at the restored Grand Hotel, which has reopened in the last year after 20 years of closure, as a further symbol of Bordeaux's renaissance. The excellent tourist office provides daily vineyard visits: we took in the medieval town of St Emillion, with its extraordinary underground cathedral, as part of one trip yesterday. Bordeaux today shows how urban renewal can be done. There are many British cities that could learn from its success, not least its twin city of Bristol. So every August we are told that increased success rates demonstrate declining standards in state schools (increased success in private schools, by contrast, is usually put down to hard work and good teaching). I reject this ration-book view of talent and opportunity. It was a bad recipe for the 20th century and is a disastrous one for the 21st. Successful societies flourish above all else by mobilising talent and educational potential. There is no genetic or moral reason why the whole of society should not succeed to the degree that the children of the professional classes do today, virtually all getting five or more good GCSEs and staying on in education beyond 16. On the basis of rigorous standards, we should strongly welcome annual increases in pass rates. We should not bemoan the 19.5 per cent getting A* and A grades at GCSE (up from 14 per cent in 1997), and the 46 per cent getting five or more good GCSEs including in English and maths (up from 36 per cent in 1997), but ask how we rapidly increase these proportions higher still. Every 16-year-old without incapacitating special needs should get five or more good GCSEs including English, maths and (where appropriate) vocational equivalents; the challenge is to improve schools and raise social aspiration to bring this about. Barack Obama has proved himself to be exactly the candidate many of us feared he would be - aloof and elitist, with little capacity to deal with the Republican attack machine. Sure, he has the right image for crowds in Berlin or Guardianistas in Britain. But his lack of the common touch is proving his Achilles heel. News from Zogby that he trails John McCain 46-41 confirms this blog's worst fears. With next week's Denver convention, Obama still has a chance to turn things round. He can get a good VP candidate; and he can hope that McCain's notorious temper gets the better of him. But as the candidate who won on the basis of leftist caucuses rather than popular primaries, it is a tall order to win through. I hope he succeeds. But the odds are now stacking up against him. There may be an August lull in speculation over Gordon Brown’s future. But Brown faces a testing September, as he seeks to relaunch his government. After a summer marked by David Miliband’s veiled leadership bid, and some unions backing Alan Johnson as an alternative, Brown will need to do much more than produce a strong economic plan or a cracking conference speech to survive. This is not just about communications. The PM fares badly against the former public relations professional, David Cameron. But with a far clearer sense of where he and his government are heading, he could overcome that weakness and regain credibility for his government, while exposing the paucity of Conservative thinking. This means having the right policies and the right team to deliver them. Brown’s problems owe much to a combination of confused messages on key policies and a tendency to substitute micromanagement for strategic focus. The recently leaked memo, supposedly written by Tony Blair last year, complained that Brown had “dissed” New Labour's own record, warning that this was “a fatal mistake if we do not correct it." To be fair, since January, Brown has started to change tack. There has been more clarity in the government’s education, health, energy and welfare reform policies. But this has been ignored by a media that has viewed the government as past its sell-by date - a process that has been exacerbated by the earlier ‘dissing’ of reforms. Both the public and the commentariat believe that Labour is playing second fiddle to the Tories in the battle of ideas. Education is a good example. Tinkering with the independence of academies, an attack on church school admissions and confusion over the future of A levels have enabled the Conservatives’ astute spokesman, Michael Gove, to win an intellectual advantage over the schools secretary Ed Balls. This at a time when Gove has been ditching support for new grammar schools and embracing Labour’s academies alternative. In fact, Brown has expanded academies faster than was planned by Blair. Balls has targeted 638 low-attaining secondary schools in the inner cities for rapid improvement and Brown has been keen to use academies as an instrument for school reform. But the prime minister’s early reluctance to sing their praises for fear of upsetting backbenchers has given Gove an advantage on a subject that was Labour’s own. Across several policy areas, stealthy radicalism has meant that Brown has been denied any credit as a reformer. In part, this is the result of a wish to avoid confronting ‘Old Labour’ backbenchers who supported him while he was leader-in-waiting. But it is also a reflection of his own voracious appetite for detail, which means that he can too often become obsessed with minutiae while missing the big picture. So, if the refreshed Brown is to remake his mark, he needs to become a strategic leader who uses his formidable intellect – and the brainpower of his policy, strategy and delivery specialists in No 10 – to focus on the issues that matter most, leaving ministers and their departments to work on the rest. And he needs to be very clear to the public about those priorities and their radicalism. A sharper focus could start to turn Labour fortunes around. Aside from any housing and economic stimuli, this might mean polyclinics in health, turning around failing schools and cutting violent crime. Brown would be regularly briefed on progress, and could insist on action where it was not being taken, while using his ministers to ensure that these policies were far better communicated. That means having the right people in place. In schools and health, much of the leg-work is already being done by Lord Adonis and Lord Darzi. If Ed Balls gets his expected promotion, a strong pro-reform schools secretary, like John Hutton or Hazel Blears, would be vital. Alan Johnson should stay at health, but might also provide stronger communications of the government’s message, possibly as deputy PM; Jacqui Smith has the right down-to-earth instincts for the Home Office, but has suffered from a rival Home Secretary in Jack Straw at Justice. If Smith is to stay, it would be wise to move Straw, perhaps back to the Foreign Office, while making David Miliband Chancellor, moves that would show both boldness and self-confidence. Brown may also want to bring back strong ex-ministers like John Reid, Alan Milburn or David Blunkett, though mischievous speculation about Milburn as Miliband’s likely Chancellor may reduce his chances. But the reshuffle will be a one day wonder unless it is accompanied by a much more strategic approach from Downing Street. If Brown is ready radically to change the way he does business he could turn Labour’s fortunes around, as well as his own. Yesterday's death of the leading Dubliner Ronnie Drew marked the passing of one of Ireland's greatest singers. His gravelly voice was unique; his storytelling captivating; and his ability to survive and thrive through four decades of music remarkable. We saw him in Cork two years ago at a concert where Liam Clancy also played, and one felt one was in the presence of a musical giant, even if the voice was not all that it had been. The late Luke Kelly may have been the intellectual driving force of the Dubliners; Ronnie was their heart and soul. He will be missed. To see Michael Frayn's Afterlife at the Lyttleton Theatre yesterday afternoon. A full house for the play that has been panned by some critics was testimony to the quality of the production, marked by fine acting and magnificent sets. The story of Max Reinhardt, a great Austrian Jewish impresario who started the Salzburg tradition of staging the play Everyman, and had created some large German theatres in the early 20th century, is fascinating in its own right; with the rise of the Nazis, he found himself exiled virtually penniless to a United States that held little appetite for his talents. This, the third in Frayn's trilogy that included the fine Copenhagen and award-winning Democracy, is perhaps less profound than its author would wish us to believe; Reinhardt as Everyman strains credulity. But taken as a biographical tale of a great man it works, with much of the credit due to Roger Allam as Reinhardt. We saw the latest Batman movie, The Dark Knight, last night, and it still seems to be filling the cinemas. It is an extraordinarily dark film, with a vision of Gotham that is in the grip of gangsterism and the evil Joker (played with sinister aplomb by the late Heath Ledger). Christian Bale is the millionaire Wayne who doubles up as Batman, with an entourage including Michael Caine and Morgan Freeman. The convoluted plot involves a Chinese accountant absconding with all the city's mob money; a DA Harvey Dent (Aaron Eckhart) determined to clean things up with the help of a flawed Lieutenant Gordon (Gary Oldman); and the wonderful Maggie Gyllenhal as Rachel Dawes, who divides her love between Wayne and Harvey. There are some shocking scenes of violence, which have prompted campaigns for it to be upgraded from 12A to 15 (it is PG13 in the US), though it is of a comic book quality. But while the special effects were magnificent and the acting is superior, the whole enterprise feels overlong and ultimately unsatisfactory; inevitably there is no happy ending, but one doesn't feel one cares greatly about any of the characters after 150 unrelenting minutes. The annual A-level day is a time of joy for many of the candidates, but a moment for inevitable disillusion among media commentators. Yet whatever the reasons for the rise in A level passes - and, frankly, the idea that students are entered for A levels who are incapable of getting at least an E in the subject has always seemed absurd to me - or in A grades, where there may be more reasonable questions about grade inflation, there is one heartening and incontrovertible fact that emerges: science is on the rise again. We regularly hear the likes of Richard Sykes, the Imperial vice-chancellor who nearly destroyed the chances of variable fees with his hyperbolic expectations in 2002, bemoaning the apparent constant decline of chemistry and physics. Yet, today's figures show that entries in both subjects are up significantly on last year, and this is the second year this has happened; chemistry has been strengthening for several years. Maths is also significantly up. Add to that big improvements in the number of university science and engineering undergraduates, and you have real evidence that the decline of science is being reversed. Given the considerable effort to improve take-up in the so-called STEM subjects, this must surely be a matter for celebration. I'm sure this heartening news will dominate the media coverage over the coming days, won't it? Yesterday's publication of this year's Key Stage 3 tests came with an increasingly vocal call for their abandonment. The results have, apparently, changed little in the last four years, so the tests are said to serve no useful purpose. Let teachers mark them, goes the cry from correspondents on newspapers that normally serve as the last bastions of support for accountability. But such siren calls should be ignored. The tests may be too much for able youngsters who can breeze through a level 5 - the expected standard - but in schools that are struggling to escape from failure and low attainment, they are an important step towards success, and a vital external vindication of their efforts. This is as true of academies that started from scratch as it is of schools coming out of special measures. Of course, such institutions need to be innovative to succeed, but they need validation that their efforts are not merely a modish experiment, and are leading to practical - and measurable - results. This is not to say there should not be changes. External testing could be confined to English ands Maths, the two basic subjects that matter most. Given the increased focus on these subjects at GCSE, it is a valuable progress check for teachers. The science lobby may be dissatisfied with internal marking, but the government should do far more to maximise the availability of triple science at GCSE at the same time as dropping the external science test. This change would have the added benefit of reducing the pressure on the markers. The second change should be in timing. 13 should become the normal age at which the tests are taken, rather than 14. A growing number of schools do this already. This would give greater encouragement for remedial teaching in the 3Rs where it was needed. It would allow an extra GCSE preparation year for those who needed it and more opportunities for a sort of 'gap year' of arts, culture, volunteering and sports for those who didn't. Schools could opt to enter pupils in Year 9 if they wished, but Year 8 would become the norm. The progress tests - where pupils cannot exceed the level for which they are entered - are a disaster waiting to happen, because of their complexity; this is a far more straightforward way to allow pupils to be tested when ready. And thirdly, the value added measures used by the government in its league tables, already far too complicated in their make-up, should concentrate on progress from Key Stage 2 to Key Stage 4, and not offer any perverse incentive to underperform at Key Stage 3. With these changes, Key Stage 3 would continue to provide a vital external progress check on the 3Rs, but would do so in a way that freed schools and markers without losing independent accountability. My one and only visit to Tbilisi was in summer 1990, a year before Georgia achieved its internationally recognised independence. I spent the best part of a week there. The terrible news of bloodshed and aggression this last weekend brought back memories of that strange summer visit. The city had the feel of a fading Soviet entity with near-empty shops, but one full of proud people conscious of Georgia's remarkable - and little appreciated - history. There were lively demonstrations in the streets (people had died in some) with a heady mix of foreboding and freedom in the air; the people displayed a remarkable friendliness which combined with a fierce sense of nationalism and sheer loathing for the Soviets, tempered little by the fact that Stalin, whose visage could still be seen on a few Tbilisi buildings was born in Gori, the centre of so much of today's fighting. But Tbilisi was then an oasis of calm compared with our next stop of Yerevan, the Armenian capital that was then a melancholy place with a war over the disputed Karabakh region in full swing with Azerbaijan and the memory of a devastating earthquake combining with the people's deep sense of injustice best seen in the city's holocaust museum (in memory of the victims of the Turkish genocide early in the 20th century). With a nightime curfew, only two tourist groups had visited the city that summer. The Caucasus are no strangers to trouble. There is no doubt that President Saakashvili acted foolishly in seeking to reclaim South Ossetia, which is part of Georgia's sovereign territory, by force, even if such action came after weeks of provocation little reported outside the region. But equally there can be no doubt that the Russians are now acting as both aggressor and bully in their wholly disproportionate over-reaction. They simply have not come to terms with the fact that the Soviet Union is no more, and a host of fiercely independent nations, often with Russian minorities, has grown up bordering Russia. David Clark is right to argue in today's Guardian that the West should stiffen its resolve against Russian bullying; the G8 certainly seems a good place to start, with pressure to find a solution that builds on the Georgian offer of quasi-independence for the disputed regions (including Abkhazia). UPDATE: Georgia's President Saakashvili makes a persuasive case in today's Wall Street Journal, with a useful reminder of past Georgian restraint and a catalogue of provocation by a Russia that is supposed to have been an 'honest broker' in the region. Here's a surprise! Having abandoned university fees in 1997, just as England was facing the reality of mass higher education, and introducing them, Ireland's education minister has put the issue back on the table. The abolition of fees has been terrible for Irish universities and has done nothing to address inequalities in access to higher education. But successive governments have been terrified of a backlash among the middle classes who have benefited from the measure, despite regular independent advice that fees were needed. Gradually increasing 'capitation charges' are all that has been allowed. However, with Ireland facing a credit crunch at least as sharp as that in the UK, and the prospect of a pay cut for lecturers to keep universities afloat, fees are back on the agenda. Ireland's university leaders will be hoping that education minister Batt O'Keeffe has the courage of his convictions. Plans for a new skills academy in Bath, sponsored by the South West's leading inventor and entrepreneur James Dyson, have been called in by the planning minister, Baroness Andrews. The decision to support the new design and engineering academy, which is backed by local head teachers and business, was taken by Bath and North East Somerset council, albeit despite the objections of its planning officials and the Environment Agency. (As some have observed, this is not normally how Bath does business, so it was a welcome surprise although it is undoubtedly a controversial issue locally.) Despite efforts to involve Unesco, the building where it will be located is a disused (if old) cranemaker's works in the South Quays area which is in need of just this sort of boost (Bath is not simply an extended Jane Austen film set). 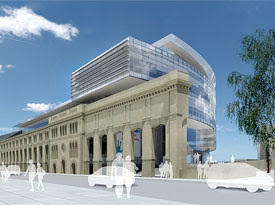 As the picture shows, Dyson's design for the academy has elegantly sought to incorporate the Victorian facade to provide an unprecedented amenity for local young people. As with any riverside site, there is a flooding risk, but this will be covered in the design. The planning inquiry will delay the school yet further; the minister should set it a tight deadline. After all, if the government wants to trust local decision-making, surely this a great case in point? To see the revival of Peter Nichols' black Bristol-based comedy Born in the Gardens last night. 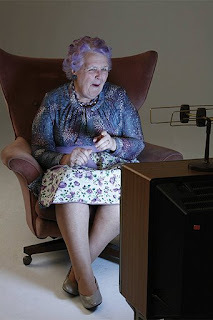 The play, part of the Peter Hall season in Bath's Theatre Royal, is enlivened by a fine cast, particularly Stephanie Cole as Maud (pictured), who whiles away her days between 'last minute shopping' at the local hypermarket and talking to her television with the sound apparently not working. She lives with her fortysomething son, with whom she shares increasingly improbable cocktails, while he deals in pornographic antiquarian books and plays his drumkit and jazz 78s. After Maud's husband dies, her son Hedley, a caricature of a backbench Labour MP, and her daughter, Mo's twin, who has acquired a glamorous veneer in California, return to the mock tudor house that had been their family home, with the inevitable rows and revelations. The play was originally performed in Bristol's Old Vic in 1979, and though it has a dated feel for the period in its politics at least, the melancholy theme has a timelessness and universality of its own. Don't miss this fine production, if you get a chance to see it. While the media have been obsessing about whether David Miliband will be PM or Alan Milburn his Chancellor, it has been left to two junior ministers this week to show their colleagues how the government should take on the Tories, whatever happens after September. Until now, the Tories have been getting away with murder in their claims about Labour's record. Jim Knight's combative and accurate exposition of the government's record on improving education for the poor in the face of Michael Gove's selective statistics on Monday's Today programme and Ivan Lewis's brilliant defence of the NHS this morning against Andrew Lansley's characteristically cretinous smears both offer an object lesson in what has been so patently missing from government ministers over the last year. Of course, the Government needs to set out a sense of direction. It needs clear policies. And it needs to address economic and housing worries. But it also needs to defend its record. This it has largely failed to do recently. Ministers too often refuse to debate their Tory counterparts, giving them a free run. Which is why the contributions of these two ministers this week were so refreshing. Exposing Tory misrepresentations about Labour's public services record over the last decade with facts and candour is an essential part of any fightback. Let's have more of it. Your statistics question for 10: Which is likely to be more accurate? The test results of 600,000 11-year-olds published today in aggregate form, and showing a modest improvement, with the insistence of the scrupulously independent chief national statistician and the independent exam regulator that their 99% sample is a fair reflection of the overall national test results for 2008, despite some delays in their marking. A survey by a right wing think tank, which has never knowingly supported anything associated with the Labour government, that quickly questioned 107 out of 9600 secondary school heads of maths, science or English (about 1%, with a sample skewed towards heads of English) about the quality of SATs at the height of the fuss about this year's tests (problems which actually affected Key Stage 3 English tests most) telling us that they have no confidence in the tests. The shadow education secretary, Michael Gove, is trying to suggest two things in a speech today. The first is that Labour has done nothing to narrow educational inequalities, and has lowered standards. The second is that the intervention of the state is bad for the poor when it comes to education. But he has been misreading the statistics. And in his misreading, he is in danger of failing to see how the state can enhance parental choice and diversity. Gove's main target is the educational maintenance allowance. And in his critique of the EMA he exposes the flaws at the heart of the wider argument. Gove complains that a relatively small proportion of EMAs go to those in receipt of free school meals (FSM). But only 14% of students receive free meals. And inequality in educational opportunity has extended far beyond that sixth of the population. I am not a great fan of EMAs, and believe some better targeting of young people in their early years of secondary school might be as valuable, but their success with those just above the FSM line reflects where Labour's wider education policies have had most effect. The government is its own worst enemy when it comes to statistics. Or rather its statisticians are, because of their constant desire to change definitions, not least when it comes to social class. But the Youth Cohort Study has shown that where standards have risen - and apart from on Mr Gove's rather broad definition that includes GCSE modern languages, which have suffered from too much choice for students and too little state diktat, they undoubtedly have risen at all ages - those rises have been strongest among children from non-professional families. Have a look at Table 4.1.1 here and among ethnic minorities. 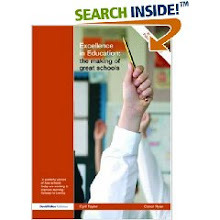 The gap between those in 'unskilled manual' and 'managerial/professional' background youngsters at GCSE was 45 points in 1997; it was 39 points in 2006; more significantly, perhaps, the biggest improvements have occurred among those from intermediate or lower supervisory skilled families, those who might have been skilled manual or semi-skilled manual labour in the past. All of which suggests that the problem is not as straightforward as Mr Gove would have us believe. For there has been a big narrowing of the gap between those who might have been the skilled working class in the past and the professional classes, and it is an achievement that the government should be shouting from the rooftops. Most of them are not entitled to free school meals and they have aspirational families who want them to get on. They are the groups supposedly benefited by grammar schools, though they are being helped far more by academies and good specialist comprehensives that stretch them, a process with which targets assist. Indeed, the differential improvements in particular social and ethnic groups also counter the notion that standards are uniformly falling - were this so, change would be equal across the board. Government policies, which include highly successful floor targets for schools, something Mr Gove ignores at his peril, have played a big part here. But government has been less successful with the poorest sections of society. However, there is no evidence that they are most likely to succeed if the state stands aside. Indeed, it is often because their parents lack an aspirational interest in education that they are less likely to push their children to achieve. Strong schools, particularly academies, are starting to make a difference. But that has meant a degree of planned targeting - by the state - and tough floor targets to ensure that schools in the poorest communities are improving. These are the pupils for whom compulsory phonics and strong early years education, followed by personalised targets, are vital. And even if the schools delivering them are increasingly diverse, there must still be a minimum education entitlement if they are not to be further failed. Michael Gove is a politician, so he exaggerates for effect. He has shown a refreshing lack of dogma in his embrace of academies and his abandonment of further selection. So one can only hope that his understanding of what has really happened as a result of successive Conservative and Labour reforms is less superficial than his contribution today. Some of our newspapers and children's authors have been making a huge fuss about the the early years - or foundation stage - curriculum. But a poll in today's TES shows that teachers back it, with 88% of 1480 teachers polled supporting it in principle, and 64% believing it will improve the overall experience of children in the early years, against 18% believing it won't. Remarkably, many teachers even believe it will mean more time playing outside with no change to the time spent on reading and writing. This is a huge boost for children's minister Beverley Hughes, who has doggedly defended the curriculum in recent years. And a sharp rebuke to those critics who would prefer to limit a decent early years education to those who get it in supportive home environments. I know that Ryanair did a lot to bring airline prices down, but they can hardly claim to be such a cheap option today. It is a salutary experience booking with Ryanair these days, watching their increasingly silly charges mount up. It is true, as Michael O'Leary regularly moans, that the UK Treasury takes perhaps £20 more a flight than, for example, the Irish government. But that ignores Ryanair's own taxes. They now charge an extra £16 per passenger each way in taxes of their own: £8 a bag, £4 to check in (and they don't let you check suitcases in on a computer without a charge) and £4 for the privilege of paying for it all, per passenger on each leg of the journey. If you're not careful they will also sign you up for early boarding and overpriced insurance on a website that keeps trying to add these things back. And if you book to return from a different European airport than the one you travel into, you pay a currency surcharge which adds another £4 to the cost. Add to that the incessant blather on the flight as they try to sell you scratch and phone cards. You pay a lot for your 'no frills' experience. But Michael O'Leary has surely missed a few tricks. After all, we don't yet have the £5 charge for a seat - we could sit on the floor if they ripped them out. And what about a tenner to use the airport steps - after all, we could just jump off the aircraft? Or a fiver for peace and quiet on the plane? No wonder he looks so confident about surviving the credit crunch.